Carte de visite from L’Institution des Jeunes Aveugles, Toulouse (1860s/70s). Dimensions 113 x 68mm. 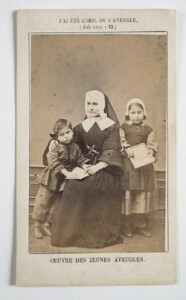 This carte de visite promoted the work of the Institution for Young Blind People in Toulouse, which had been established in 1866 by a community of nuns to teach blind children subjects including reading, writing, arithmetic and manual labour. It depicts a young boy tracking an embossed textbook resting on a nun’s knee, and a girl inscribing onto a writing frame. A notice printed on the reverse of the image describes how support is freely given to blind children with the support of charitable giving in Toulouse, but funds were running low as the number of children educated increased. Outstanding post, you have pointed out some superb details , I as well conceive this s a very superb website.